Darla Miles reports from Denville. DENVILLE, New Jersey (WABC) -- This is the nail-biting time of year when high school seniors are hearing back from colleges to which they've applied. For one young woman in New Jersey it's a magical time. She was accepted to all eight Ivy League schools, plus, for good measure, Stanford. "Harvard, Yale, Columbia, UPenn, Brown, Cornell, Dartmouth, Princeton and Stanford," said Ifeoma White-Thorpe, Morris Hills High School Senior. It's that moment when you shoot for the stars and actually make it. "I want to go into global health and study biology and so many of them have great research facilities, so I was like, I might as well just shoot my shot and apply," Ifeoma said. Ifeoma got eight acceptance letters from Ivy League schools. "I was shaking, I was like, oh my gosh, oh my gosh, like this might be eight out of eight and I clicked it and it said 'Congratulations' and I was like oh my goodness and then I was like, what did I say?" Ifeoma said. "How many years do I have left to make a change," she said when she won the national Selma speech and essay competition. It doesn't hurt that she aces her AP classes and is the student government president. "I think my love for poetry and writing just really stood out," Ifeoma said. Now that Ifeoma has been accepted to so many schools, the hard part is going to be deciding which one she will actually attend when she graduates in June. "I got into Harvard early action so I figured I'll just go there, so then I got into all the others and I was like, wait now I don't know where I want to go," Ifeoma said. "Do you have a choice of what school she attends at this point?" Eyewitness News Reporter Darla Miles said. "We're leaving it up to her," said Andre and Patricia White-Thorpe, Ifeoma's father and mother. It's a decision that may be easier than she thinks. 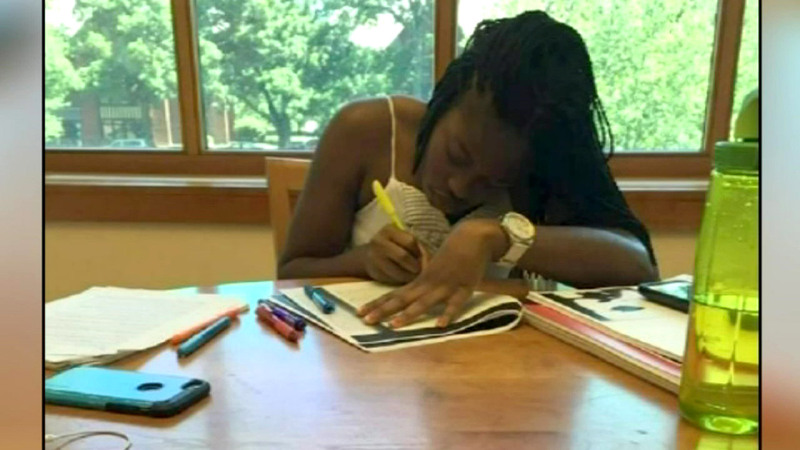 "At this point none of the schools I've applied to said they give merit scholarships, so I'm praying that they give me some more financial aid or some money, shout out to all of those schools, please give me something," Ifeoma said.